Rungwane Matheba obtained his LLB from the University of Limpopo in 2012. He completed his degree in record time and achieved 12 distinctions. He didn't stop there, he went on to complete a short course in Medical Law in 2018. Rungwane was admitted as an Attorney of the High Court in 2014. 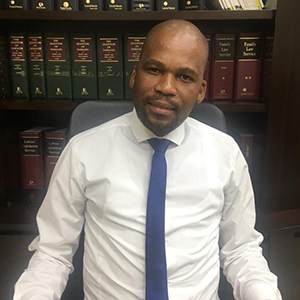 Rungwane is an experienced as a legal practitioner, he began his legal career in 2013 when he joined Legal Aid South Africa as a Candidate Attorney. He was responsible for advising clients on various legal matters, drafting of pleading and settlement agreements, representing clients in court on criminal as well as civil matters. In 2015 he joined Mafori Lesufi Incorporated as a Professional Assistant, where he was responsible for conducting legal research, obtaining instructions from clients, drafting legal documents, as well as attending to magistrate and high court matters. Rungwane joined the team at Mphela and Associates from April 2019 as a Junior Associate, he is based at our Head Office in Groblersdal.